The Scream, by Edvard Munch, 1893. Wow, this painting really goes well with the new color scheme on my blog, which was in turn inspired by Saul Bass' movie posters. I wonder if Bass had The Scream in mind when he created the posters for Vertigo, Anatomy of a Murder or West Side Story? Says the woman at the Tides Restaurant: "I think you’re the cause of all this! I think you’re evil!" Is she speaking to Melanie, the audience, or Mr. Hitchcock? On the surface, parallels between the painting and the film are obvious. The brooding, malevolent sky of the painting is echoed in the sulfurous grey skies in the film. Albert Whitlock, another longtime Hitchcock collaborator, spent a year painting the complex matte scenes (analog precursors to modern bluescreen technology), which added buildings to the town of Bodega Bay and changed the blue maritime sky into a cloudy one “to give it mood,” as Whitlock said. Lydia brenner (Jessica Tandy) runs in horror from room where she discovered the corpse of her neighbor with the pecked-out eyes. Other elements in the painting, such as its location near a body of water are similar to The Birds’ location, in which the bay prominently figures. Meanwhile, Melanie Daniels (Tippi Hedren) and other characters get plenty of exercise running from terrorizing situations, as does the main figure in The Scream. But beyond those surface similarities, there’s more to say. The Scream is a unified work of art. That is, each element reinforces the other. The hellish sky and lake are a projection of the terror reflected in the principal figure’s face. A great deal of the horror of the painting is in the figure’s eyes. They convey that what he is running toward is no shelter from the dreadful place he’s trying to escape. Yet, the painting is ultimately subjective. Note the two figures complacently, calmly, traversing the bridge behind the main character. Though it seems that his mood has actually changed the weather, the main character's emotional frenzy is uniquely his own. That’s an important distinction to make. In this way, The Birds echoes the spirit of The Scream, not just its content. The painting's emphatic subjectivity is what makes it universal. Because who doesn’t feel alone in his or her anxiety? Following the attack in the attic, Melanie, traumatized, swings at imaginary birds. Just as Norman Bates said, "We're all in our private traps — clamped in them — and none of us can ever get out. We scratch and claw but only at the air, only at each other. And for all of it, we never budge an inch." Within the movie's own context, the only plausible rationale for the bird attacks is either a purely subjective one — they are brought on by Melanie's arrival in Bodega Bay and hence are an exterior manifestation of the emotional chaos triggered by her frivolous romantic intrusion in to the lives of Mitch Brenner (Rod Taylor) and his family — or they are objective and random and therefore abstracted into meaninglessness. (Attempts to explain the attacks as either payback for man's abuse of animals, or as expressions of divine wrath are discredited at the scene in the Tides Restaurant.) Both explanations are plausible, and comfortably hang side by side, contradictions be damned. 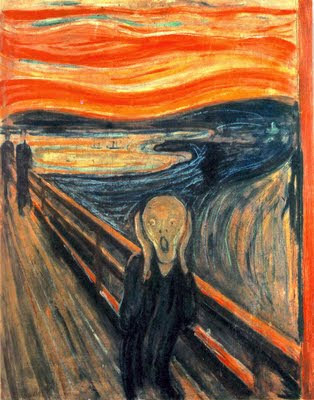 And that brings us right back the The Scream, which is also both deeply personal and emotionally abstracted. Well, that’s all nice theory. But here’s the real test: who doesn’t look at The Scream and immediately “get” what it’s about? The same is true of The Birds: it endures because its appeal is both personal and universal. Nobody doesn’t get The Birds. Joel said, "The Scream, by Edvard Munch, 1893. Wow, this painting really goes well with the new color scheme on my blog, which was in turn inspired by Saul Bass' movie posters..."
I have to second that notion..your colours scheme and the colours in Edvard Munch the Scream are pretty close in colour. ..."I wonder if Bass had The Scream in mind when he created the posters for Vertigo, Anatomy of a Murder or West Side Story?" Joel, I don't know the answer to this question even though I was checking out his (Bass) website that you linked a few minutes ago. "Well, that’s all nice theory. But here’s the real test: who doesn’t look at The Scream and immediately “get” what it’s about?" I must admit that I’ am little bit under the "weather," but I had to read your post (food for thought…I’ am so sorry for using the cliché..) and response. I'm a great Hitchcock fan and can't wait to see the movie that Anthony Hopkins is making where he plays Hitchcock. Great review thanks. Yes! "Alfred Hitchcock and the Making of Psycho". Been in the works for a couple of years. And guess who plays Alma? Helen Mirren! With Helen Mirren it should be great, two of my fav actors in one movie. My fav Hitchcock has to be Marnie - I've seen it at least 6 times. Nice blog will enjoy reading more, thanks. MARNIE is one of my faves as well. In fact, I prefer Tippi's performance in that one over THE BIRDS. So do I - it's more neurotic with that squeaky voice when she has nightmares, almost possessed. Hitchcock's women are most interesting characters (I didn't know about his attraction (to put it mildly) to them. Seeing the movies all in a different light now, thanks to your reviews! Can you recommend really good Hitchcock bio for me? I've lately been enjoying Patrick McGilligan's "Alfred Hitchcock: A Life in darkness and in Light," which doesn't break much new ground but does sum up a lot of scholarship over the last 30 years. Donald Spoto's "Dark Side of Genius" has some basically good insights, but I hate the judgmental attitude he takes toward Hitch. The guy has an axe to grind. Read it, but do so with dish filled with large grains of salt. Thanks for that Joel, prefer the sound of the first one - I don't like salt without the popcorn!